diminishes the story and is a sure recipe for a bad gaming experience. Over the years I played RPGs with literally hundreds of game masters and only a very few had any real skill at public speaking. Oh, they had lots of verve and desire and put together a fun game, but no formal training and it showed in some classic speaking mistakes. What really pains me is that the mistakes are small and so simple to fix, but significantly degrade the GMs presentation. Before continuing, I should mention my public speaking qualifications so you do not think I rant without justification. I did competitive public speaking in high school (I did debate) for four years. Finding it fascinating, I went on to get a rhetoric degree from the University of California. I understand of the basics of good public speaking that most GMs need. Am I God’s gift to public speaking? No. There are many speakers far better than I. 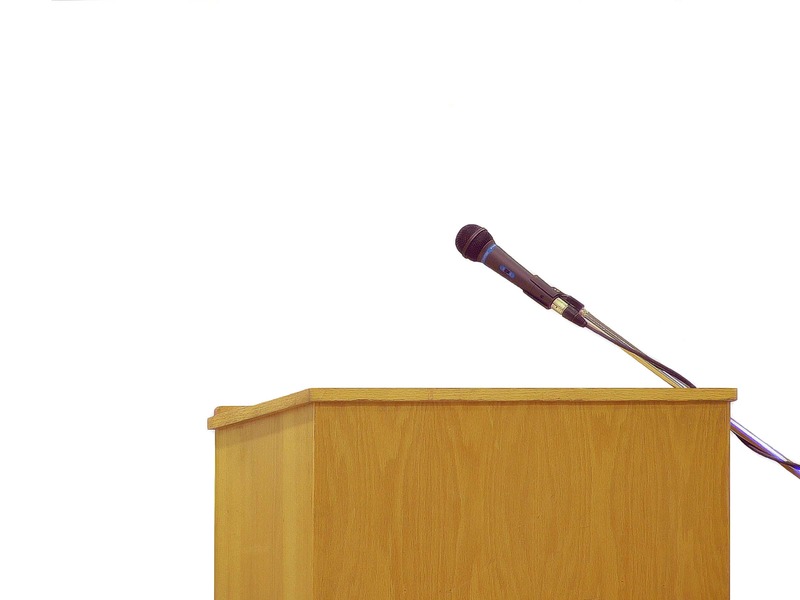 Am I a better speaker than the majority of the population that fear public speaking more than death? Yes. There are a few mistakes that I see over and over among game masters that, if rectified, will seriously improve the GM’s delivery. The first item is legendary and so pervasive that everyone hears it every day and never notices. You may know it by its other name “umm.” When people are at a loss for words, they utter “umm.” I had a teacher once that was in love with this non-word, racking up 56 in one hour. (Yes, I counted.) This is an easy fix. Never use it. NEVER. “Umm” is the verbal equivalent of picking your nose in public. Stop it, just stop. If you have nothing to say, do not say anything. Do not move your lips. That said, NVUs are tough to stop because they come from a lifetime of practice, but their elimination is a critical first step to better public speaking. It is critical because it makes you think about what you are saying, building awareness of what flows from your mouth. Every “umm” interrupts the flow of your voice and makes the listener stop listening for a split second because NVU do not really have any meaning. I suggest you enlist your players for help. Make them throw dice at you, kick you or otherwise notify you that an “umm” escaped from your lips. If you get nothing else from this post, killing the “umm” will make you a better GM. A great first step. I always wondered why many game masters include the table as one of the players. Yes, the table you play upon. I know it is a player because the GM treats it like a player by looking at it and speaking to it. Human communication is not omnidirectional, focus on your listeners. The easiest way to fix this issue is always look at the players when speaking. Seems like common sense, but I observed many a GM chatting at the floor, walls, table, GM’s screen. Just about anywhere that a person is not sitting. Besides reducing volume and clarity, it disconnects the speaker from the listener. The easiest solution is always look at the person you are speaking with. Eye contact is necessary. No one every died from looking a player in the eye. Speaking of body parts, a human mouth works best when it is not full or covered. I watched GMs chew on straws, suckers, gum and a variety of other oral fixations. Food aside, most of them looked more like nervous habits than something that the GM needed right that minute. An empty mouth speaks more clearly than a full one. Give up the chewing gum! Still other GMs cover their mouth with a fist, nibble on knuckles or otherwise interfere with their voice projection. If you have a nervous habit to cover your mouth, just make a point of keeping your hands occupied. I used to do this, but found grasping the edges of my podium kept me from doing blocking my mouth during a speech. However, do not fiddle with pencils or dice so much it is distracting to your players. Do not substitute one problem for another. When running a game, try to practice your speaking parts in advance. Even if you have only a rough idea of what you will say, giving it a couple of practice runs in front of a mirror will never hurt. There are very few speakers that can deliver a smooth speech cold. Even national politicians practice before using a teleprompter on the big day. If you implement these suggestions, you are well on your way to improving your public speaking skills. Now for the bad news; you cannot read advice and get better. It takes practice. Lots of it. So much that you forget that you are not supposed to say “umm” and just never say it. If you are thinking about these techniques then you need more practice. These skills work best when ingrained into your psyche, not when you think about using them. If you need some excellent examples of skilled speakers, there is one group that far outstrips anyone I see . A speech teacher in college held up news anchors as skilled public speakers, but I argued they only speak in two-minute bursts, with a teleprompter. I think there is another group that more closely reflects the public speaking travails of a long game session. While I do not advocate their message, the average Sunday morning televangelist has real public speaking skills. They are confident, well-prepared and articulate. Smooth like wet ice. A GM should strive for the same goal(without the pleas for donations, of course). If you are really interested in developing your public speaking skills and cannot access to a speech class, I have an alternative; Toastmasters. Toastmasters is a club specifically designed to improve public speaking skills. The club is inexpensive to join and allows you to give speeches in a non-threatening environment to a group that provides useful feedback. They even have a designated “umm” counter! Really a great organization that is well worth your time. Gaming aside, investing in your public speaking skill pays benefits in everyday life as well. I still use my rhetorical skills every time I speak in a meeting or presentation at work. You will reap tangible benefit from your efforts. Oh, and it will make your role-playing game better too.